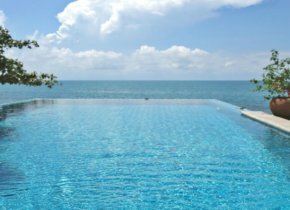 This extensive 6 rai plot of land is situated on the southern coast of Ko Samui, in the nice Bang Kao area. With 100 meter direct access to the beach this land offers spectacular sea views and constant delight of relaxing sea breeze. This huge 9600 sqm territory is surrounded by coconut palms and green trees and is a nice opportunity for housing development in this tropical island. The land has a water well and a dirt road access to the plot.